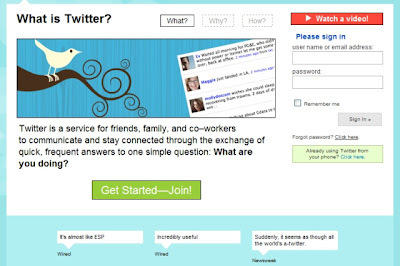 Twitter have unveiled the new Twitter homepage. Cosmetically it feels fresher (especially in comparison with its predecessor), but the biggest changes are in the Twitter homepage functionality. The integration of Search and Trends to the new Twitter homepage is interesting, especially when considered alongside the latest explanation of what Twitter is. Before the redesign Twitter was 'a service for friends, family and co-workers to stay connected', now the Twitter strapline is 'share and discover what's happening right now, anywhere in the world' - and the integration of Twitter Search and buzz (Twitter Trends) is obviously a key part of this. 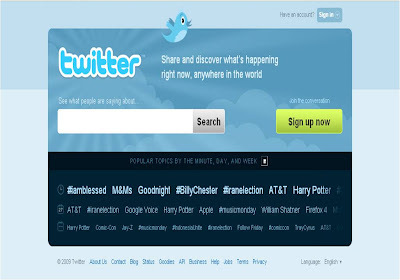 The new Twitter homepage design highlights that Twitter now has dual functionality, a connection platform and a real-time, Buzz Search engine - either share information yourself or search to see what everyone else is sharing. There are a lot of potential customers using Twitter, so it is logical that the Internet marketing to build a relationship going that are often present.